Perhaps nothing has been more talked about by recent business scholars than the necessity of teamwork and successful team building activities. There are thousands of inspirational quotes for team building out there, but here are eight of our favorites. This quote on team building captures the vision of the ideal team. No team is perfect or will operate without having any disagreements or mishaps. That team never has or will exist. The perfect team in the real world is one that is unified in its overall goal and can communicate in such a way as to resolve conflicts quickly. Creating that kind of team is the goal of all team building efforts. Once again, that unified purpose is essential to a strong team. Team members don’t have to be best friends or have similar personalities. That lack of diversity can even weaken a team. Team members do have to have a common purpose and a trust that everyone is working for that purpose. That trust and loyalty come with time as team members get to know each other. Because of that, we like thinking of this more as one of those team bonding quotes. This is a favorite quote for team building among our colleagues. If a manager or team member is only out to make themselves look good or everyone thinks they’re only out to make themselves look good, the team will not function. That essential trust mentioned in the last quote won’t be there, and just saying they want what’s best for the team won’t cut it. Actions speak far louder than words and team building activities can be great opportunities to demonstrate with actions that a team member wants what’s best for the team over just what seems best for them. Vulnerability. All of us hate it, but all of us so desperately need it. It’s the key to true connection, synergy, and innovation. Unfortunately, it can also lead to disappointment, embarrassment, and shame. Because of this, many choose to remain invulnerable and thus close themselves off to both the negative and positive emotions and results of vulnerability. They opt to stay in a very safe, very mediocre place. To be vulnerable and build the trust necessary for truly excellent teams, each team member must be willing to put their ideas out there, give honest feedback to others’ ideas, and continue trying after disappointment, failure, and rejection. No one is as overwhelmed and stressed as an individual trying to do everything. Efficiency and quality of work require delegation and teamwork. 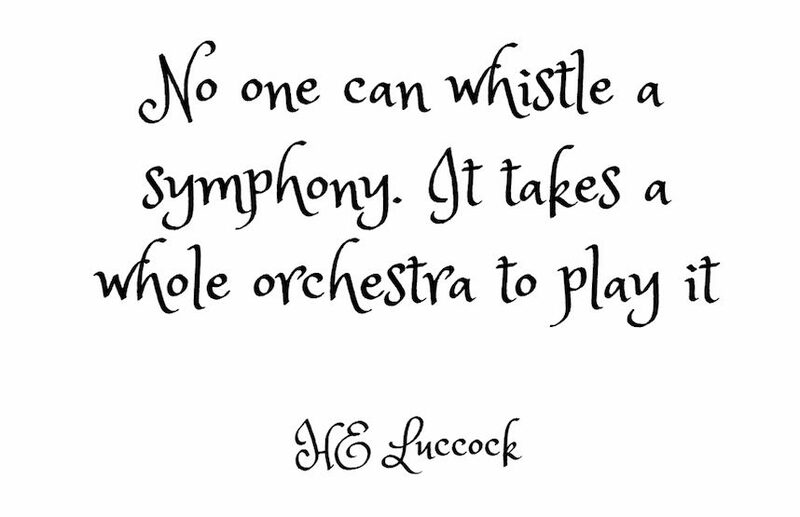 When an orchestra or a team has synergy, that means that what they create together is greater than the sum of its parts or what any individual could have done by themselves. This seemingly abrupt team building quote has a short but powerful message. True teams are not made or broken by a single person. So-called “teams” where that is true do not the team at all but simply a genius with many assistants. Powerful teams live in the paradox where each team member knows that their contribution is necessary, but their membership on the team isn’t. No one should feel they are superior to anyone else. What are your favorite team building quotes? Let us know in the comments!